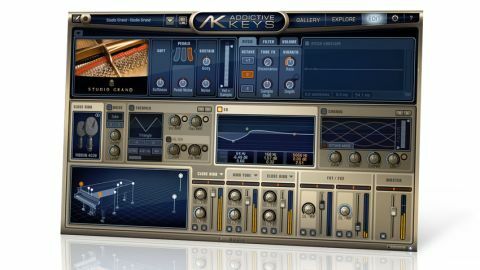 Great-sounding and easy to use, Addictive Keys successfully brings quality keyboard tones to the mid-budget software studio. Great sound and mic options. Flexible channel editing and processing. Sensible cross mod implementation. Small disk footprint and quick loading. Preview for all patches. Unnecessarily graphics-rich. No library of MIDI parts. Addictive Keys is the latest plug-in instrument (VST/AU/RTAS) from Sweden's XLN Audio, featuring three multisampled classic keyboards: Fender Rhodes Mark I, Yamaha U3 Upright Piano and Steinway Model D Concert Grand. "The aim is to provide excellent source sounds with plenty of customisation (EQ, dynamics, effects and so on), but with a small disk footprint"
Each one can be bought individually (€99 each for the two acoustics and €79 for the Rhodes) or bundled as 'The Studio Collection', and they all load into a common interface. Just like Addictive Drums, the aim is to provide excellent source sounds with plenty of customisation (EQ, dynamics, effects and so on), but with a small disk footprint (4GB for the whole lot). AD users will note some visual and functional similarities - in particular the Edit page, which includes pitch, filter and volume envelopes, as well as per-mic insert processing (EQ, chorus, compression) and two 'Delerb' (delay plus reverb) send effects. However, keys have very different requirements to drums, so the specifics are rather different. In particular, you get seven flavours of noise (eg, tape and vinyl), five types of distortion and three modulation effects (chorus, phaser and tremolo). The aforementioned Delerb units combine delay and reverb processors in one module, with a neat visual balancing window. One of the key features of Addictive Keys is that each instrument has been captured using a number of mics in a number of positions, enabling you to mix and match three stereo channels, complete with combined panning and width controls. The browser and preview pages (called Gallery and Explore) make it easy to get up and running. Presets are divided into three categorised pages aimed at producer, 'purist' and creative needs respectively. "Although you're limited to the tonality of the three source instruments, the mic options provide an enormous palette even before you touch the EQ"
Every patch has a preview MIDI performance that can be dragged into the host DAW. Unfortunately, though, that's it in terms of MIDI - there's no loop library included. Sonically, AK's core sounds tick all the right boxes, and although you're limited to the tonality of the three source instruments, the mic options provide an enormous palette even before you touch the EQ. On the downside, you don't get individual control of constituent sounds, such as pedals, or much say in the instruments' setup (lid position, for example). XLN have put a lot of work into creative patch design. The likes of Prepared Horror (grand), Reverse Attacks (upright), and Glow Sticks (electric piano) show off the insert effects as much as the source samples, to great effect. The rather clever X-modulation implementation enables the mod wheel, one selectable MIDI CC and aftertouch to be concurrently routed to one or more suitably receptive parameters, including filter cutoff, vibrato depth, tremolo pan and chorus mix. It's basic but very effective. Also handy is the Memo feature. This enables one-touch recording directly into a dedicated browser - great for quickly noting down phrases, which can then be dragged out as MIDI. On the subject of the browser, user patches can be shared and synced via XLN's cloud server. Addictive Keys successfully sidesteps the complexity of more detailed piano libraries, delivering a genuinely useful palette of core sounds and excellent processing. Like Addictive Drums before it, it wholly deserves to be a runaway success.